I was raving about Jeff Parke all the way back in December. Parke had just joined Philadelphia Union in a trade with Seattle. Parke and his wife had recently welcomed their first child and were eager to move closer to their families in the Philadelphia area. Seattle needed to free up some salary room and were willing to move Parke for allocation money. The move was a pleasant surprise compared to previous Union deals. We usually saw serviceable players leaving for allocation money. The players we brought in were usually guys with unrealized potential or older veterans coming off injury or playing out the string. Finally, the Union front office was able to use some of that allocation money to acquire an excellent veteran player in a team-friendly trade. Given our history with trades, this was a moment to rave. Parke was Seattle’s defensive player of the year the previous two seasons and had moved into the fringe of the USMNT rotation. In Valdes’ absence, Parke has proved to be a very capable replacement, and, after some early season settling down, the Union defense hasn’t skipped a beat. I remember the first game of the season and just watching how Parke brought a steady and calming influence to the back line. Parke might not have the athletic prowess of his younger teammates, but his positioning is excellent and he is always poised to making a game-saving tackle. 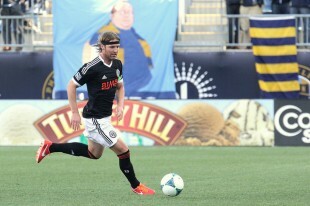 Just look at this past weekend’s game against Montreal where Parke was easily the best Union player on the pitch. As a defensive unit, the team’s 12 shutouts this season constitute a franchise record. Barring a 3+ goal effort from KC this weekend, the Union will finish the season having surrendered fewer goals than last season. If we could magically wipe away the outliers (two five-goal defeats to Montreal and New England and the late three-goal flurry from LA in a 4-1 loss), the GA would rank alongside the top teams in the league and possibly be a Union franchise record as well. Outside of those few blips, the defense has been very consistent. Hopefully another year of development will help the Union eliminate some of those mistakes and become a truly top tier defense. Almost a year after the trade that Parke home to Philly, I’m still raving about him. I think I’m going to start the Jeff Parke fan club. Who doesn’t want to root for the local boy who came home to support his family and play for the hometown team? He’s the Union player with the best hair, and he does the most pushups before kickoff. He is able to make crazy game saving tackles look ordinary and routine. All we need is a catchy fan club name. All those in favor of Daughters of Parke? Author: Kyle Mathiot Kyle is PSP's webmaster. Yep, he's the guy who fixed all the site stability problems. Hit him up on the Tweeter Machine @kyle_machine.